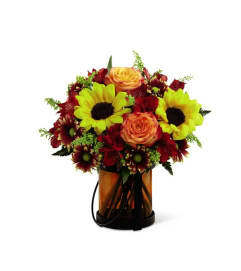 The FTD® Autumn Roads™ Bouquet glows with a harvest beauty that will delight your special recipient with each sunlit bloom. 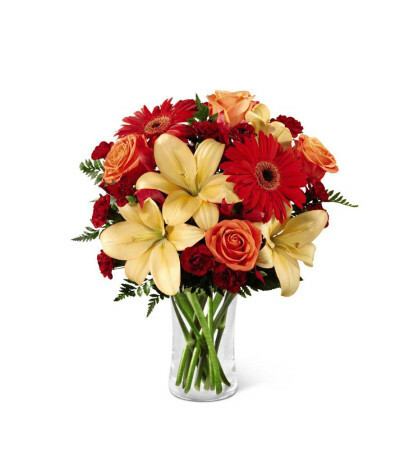 Brilliant orange roses, peach Asiatic lilies, red gerbera daisies, burgundy mini carnations, and lush greens are brought together to create a simply stunning fresh flower arrangement. 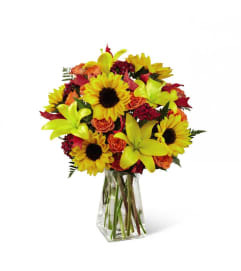 Presented in a clear glass vase and accented with red glycerized oak leaves, this fall flower bouquet will make an excellent Thanksgiving, Grandparent's Day or thank you gift.